Thomas B. Allen is a prolific historian and author whose work I have long admired in National Geographic Magazine and other publications. Allen was Associate Chief of the National Geographic Society’s Book Service from 1974 until 1981, when he left the Society to freelance as a writer and editor. His works run the gamut from World War II to Colonial America, and his book on espionage is a staple that is sold at the International Spy Museum. 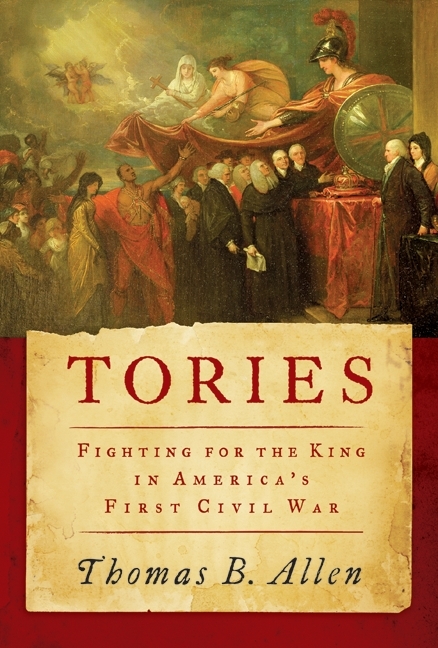 Allen’s latest book, Tories: Fighting for the King in America’s First Civil War, examines in great detail the pro-British colonists in North America who remained loyal to the Crown and to their kingdom during the American Revolution. While many colonists openly joined the rebellion, there are large pockets within the thirteen colonies where the residents either passively sat out the war, taking a wait and see attitude, stuck to their own business. However, many Loyalist men formed themselves into military units and actively supported the British Army, at times even fighting their friends, family, and neighbors. Comedian and talk show host David Letterman popularized the concept of “Top Ten Lists,” an often humorous and satiric look at current events or newsworthy people. Veteran author and Iowa educator Thomas R. Flagel used a similar concept (without the humor or satire, of course!) to present an overview of the American Civil War in his new book, The History Buff’s Guide to the Civil War (2010, Cumberland House). It is now available from amazon.com and other leading book retailers. He breaks the war down into six major chunks — Antebellum, Politics, Military Life, The Home Front, In Retrospect, and Pursuing the War. Each chapter is then subdivided in a series of Top Ten lists based upon the author’s personal rankings; for example Chapter 1, Antebellum contains the sections “Top Ten Causes of the Civil War,” “Top Ten States with the Highest Percentage of Slaves,” Top Ten Events of Slave Life,” “Top Ten Abolitionists,” and “Top Ten Fire-Eaters.” Each list is annotated and Flagel’s commentary on each section gives an overview of the topic. The footnotes are extensive and useful to the history buff who wishes to dive much deeper into the particular subject. Click on each photo to enlarge to so you can even better appreciate these fine wargaming photographs! 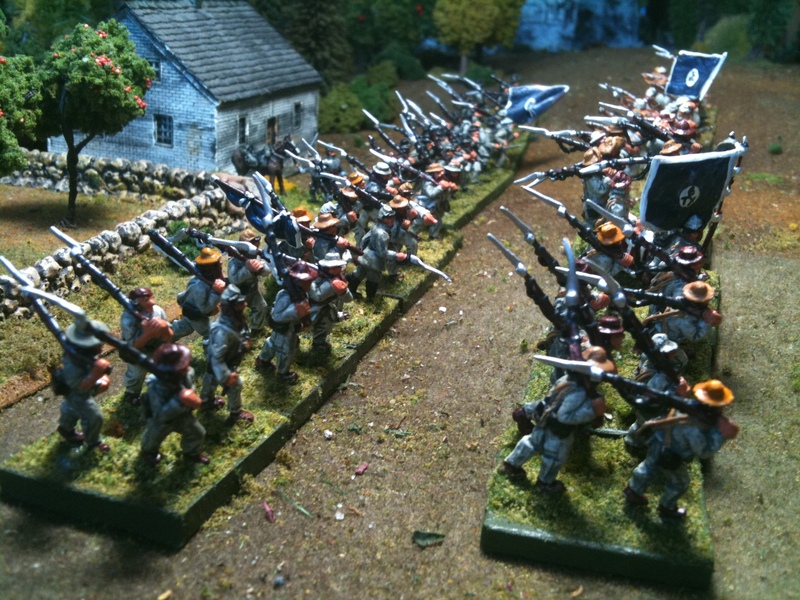 Tennessee wargamer and gamemaster Cory Ring, a long-time member of the Johnny Reb Gaming Society, sent me several photographs of a recent game he ran. These are nicely painted figures, and are a credit to his tabletop battlefield. I have long been fascinated by cavalry operations during the American Civil War, despite the fact that all of my ACW ancestors slugged along in the Union infantry. Among the important raids that are now long forgotten by the general public was Stoneman’s Raid in the spring of 1865. As part of the Army of the Potomac, Gen. George Stoneman had led a major raid in 1863 and smaller ones off and on throughout the rest of the war. In 1865, he led his troops through Virginia and North Carolina collecting supplies, harassing Confederate outposts, destroying communications lines, and severing supply routes. His actions were part of a coordinated effort among several leading Federal generals that essentially ended the war in the Eastern Theater. North Carolina author Chris J. Hartley is a professional marketer and communications expert with experience in several large companies in various industries. He has put his talents to good use in his Civil War books, including his most recent fine effort, Stoneman’s Raid 1865. Available from amazon.com and other leading retailers, this new book is sure to become the definitive book on the operation.